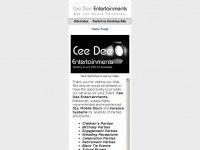 Cee Dee Entertainments - suppliers of quality entertainment: Mobile Disco Hire, Mobile DJ, Party DJ, Wedding DJ and Event DJ hire, Edinburgh, Scotland. Chris Doherty is specified as the websites creator. Mobile Style Website updated: October 31, 2018. Design and all text by Chris Doherty, Cee Dee Entertainments, Edinburgh, Scotland, UK. ©1994-2018, All Rights Reserved is the owner of the copyright for this website. three profiles were found for Chrisdoherty.co.uk in social networks. Among other social networks the website is represented in Facebook, Twitter and YouTube. The web server with the IP-address 62.233.121.36 used by Chrisdoherty.co.uk is run by Iomart DC1 Core Network and is located in Great Britain. There are many websites run by this web server. The operator uses this server for many hosting clients. In total there are at least 203 websites on this server. The language of these websites is mostly english. 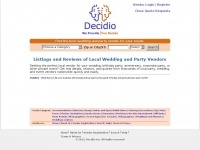 Uk-disco.co.uk - Mobi­le Dis­co Hire. 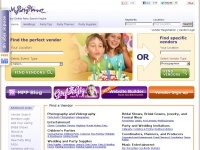 Find a mobi­le dis­co, wed­ding DJ or ..
Mypartyplanner.com - Party Plan­ning, Party Supplies, Event Plan­ning & ..
Decidio.com - Comple­te Wed­ding, Cor­pora­te Event, and Party Plan­ning ..
Eventective.com - Wed­ding, Party, and Mee­ting Ve­nues and Ven­dors - ..
Theboogiebus.co.uk - Party Bus Hire Manchester, Bury, Bol­ton And ..